This tutorial will show you how to make a pose pack that uses a CAS accessory. 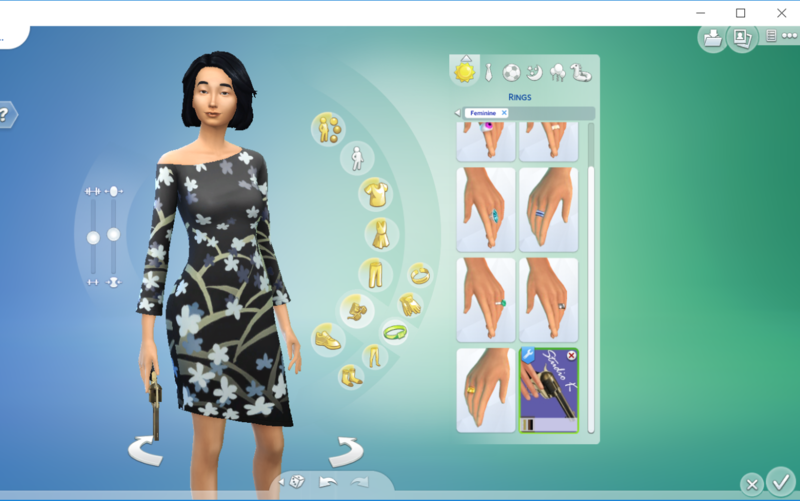 The accessory in this tutorial is karzalee 's Six Shooter, but you can use any CAS accessory that you want. If you have never made a pose before, please read the start to finish pose tutorial by orangemittens first. 1. 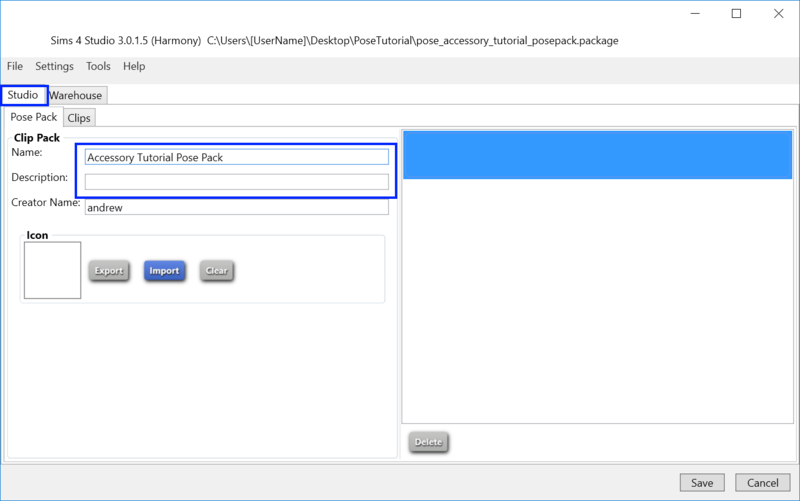 Open the CAS accessory package in Sims 4 Studio. 2. Click the mesh tab. 3. Click the Export button on the mesh tab and save the .blend file. 4. 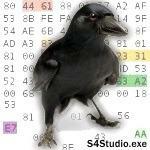 Open the .blend file that you saved in step 3. 5. 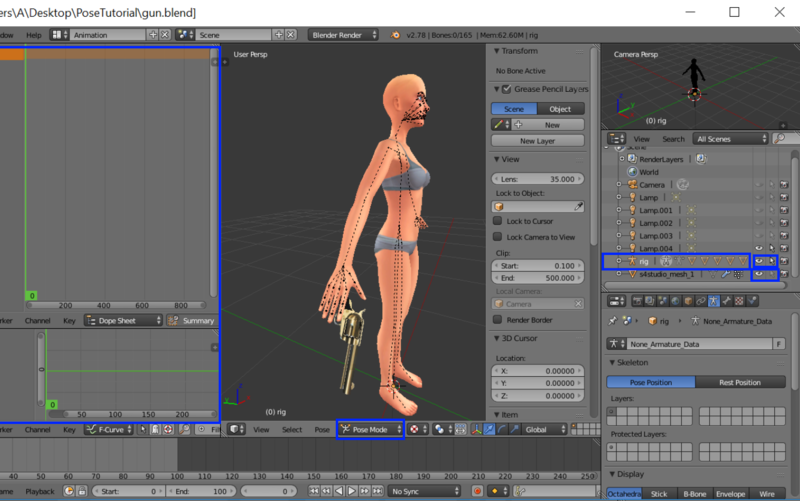 In the upper-left corner of Blender, where it says "Default", click the word "Default" and select "Animation" to switch Blender's layout to the animation layout. This is optional, but there are extra Blender features in this layout that are more useful for creating poses and animations and it gets rid of the UV panel that is not relevant. 6. 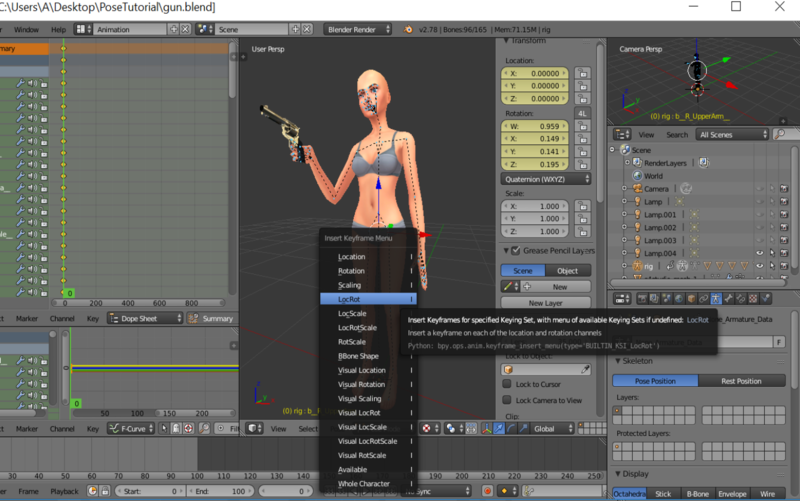 On the right side of the screen, you will see the outline showing all of the objects in the Blender scene including lights, meshes, and the rig. Next to each item is an icon with a cursor and one with an eye. Clicking the eye will show or hide the object. Clicking the cursor will make the object selectable or unselectable. By default, when you export a CAS mesh, the rig is unselectable to prevent accidental selection while editing the mesh. You will need to make the rig selectable again by clicking the cursor icon next to the rig. 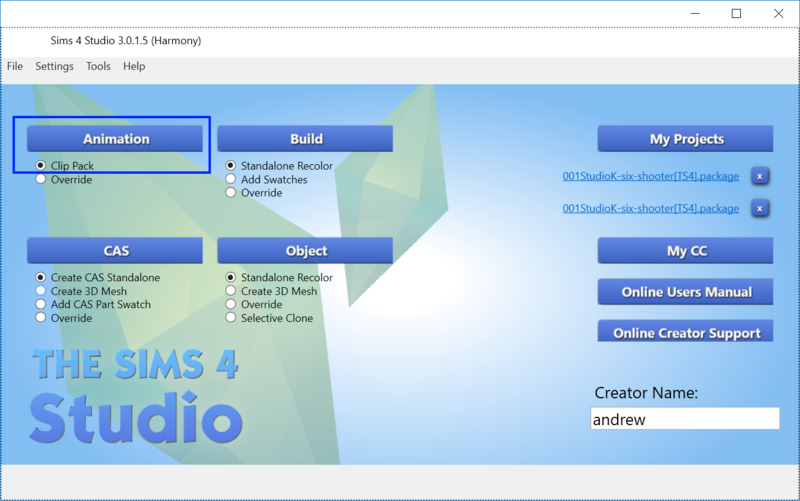 If you want to prevent accidentally selecting the mesh while you are posing, you can also click the cursor next to the s4studio_mesh objects to make them unselectable. 7. Select the rig and change to Pose Mode. 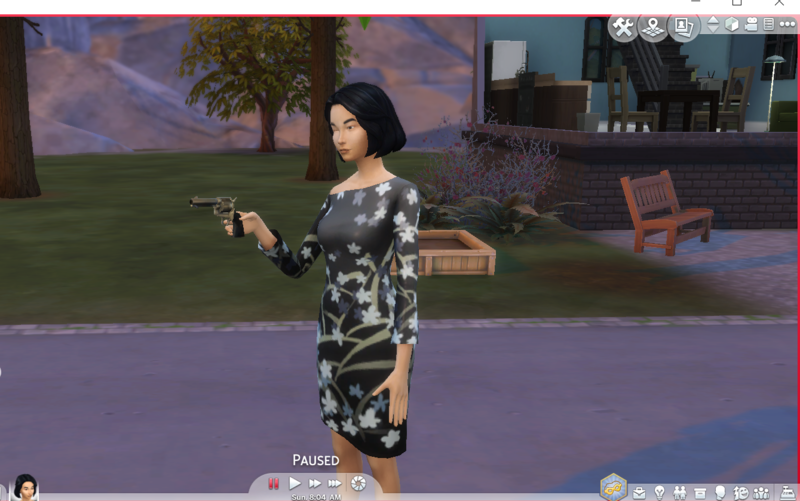 You can now begin posing your Sim. You can pose it just like you would had you exported your .blend from a pose package. 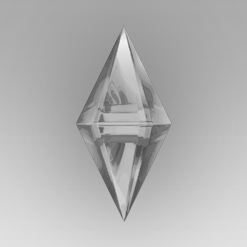 You will notice that when you rotate the bones, the accessory will move with the Sim. Remember to set a keyframe at the end and save your .blend. 8. Now that you have saved your .blend with your pose, you will need to create a package. 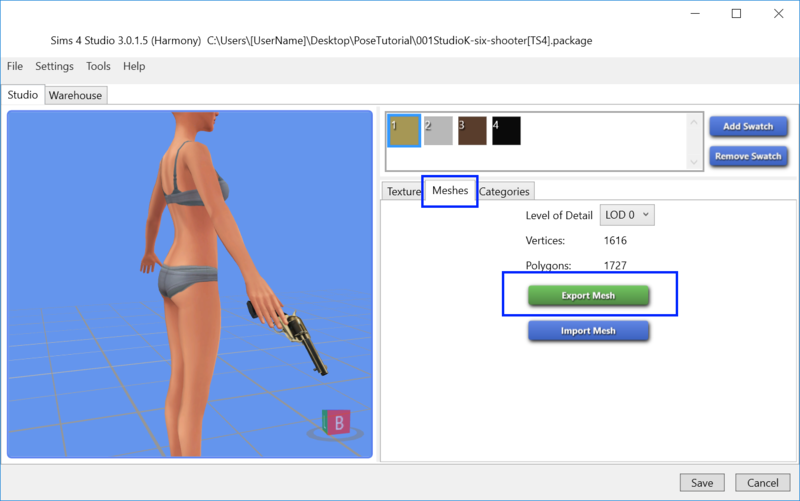 Open Sims 4 Studio and, as usual, select the Clip Pack option and click Animation to create your pose package. 9. Name your pose pack on the Pose Pack tab and then select the Clips tab. 10. 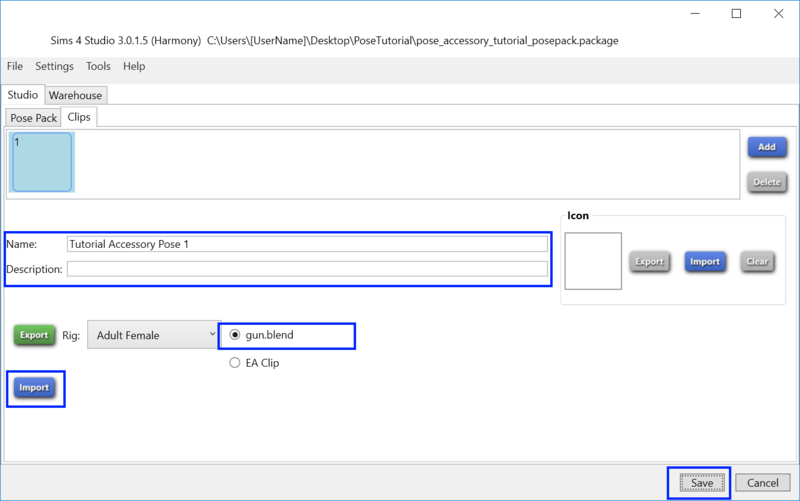 Name the first clip in your pose pack, and import the .blend file that you saved in step 7. You will see the name of your .blend to the right of the Export button. Save your package and place it in your Mods folder. 11. Start the game. 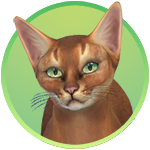 If your Sim isn't already wearing the accessory, bring them into CAS mode and put the accessory on. Awesome tutorial Andrew! I've always wondered this, I didn't get into pose making yet, but this is a great adition to it as you can be more creative with the poses you made! Thank you! Hi! New here and wondering how if it's possible to move the accessory as well? To explain more I was thinking of making a pose where one sim gives another their scarf. Oh, this one is super useful! 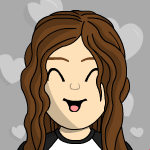 thank you for making this tut. Hi, so i have the Mac appletini version and i wanted to know if you can make a tutorial of how to use build mode objects with poses..... for example a couch or chair etc. I followed all the steps but the accessory doesn't move with the rig, do you know what I could have done wrong? When I export a mesh to blender, I can't set the rig to pose mode. Or it doesn't work. It's labeled as such but I can't select the nodes at all. Unless I select all. Any advice? Make sure to follow step 6: "You will need to make the rig selectable again by clicking the cursor icon next to the rig. If you don't do this you won't be able to select the rig or the bones in it.